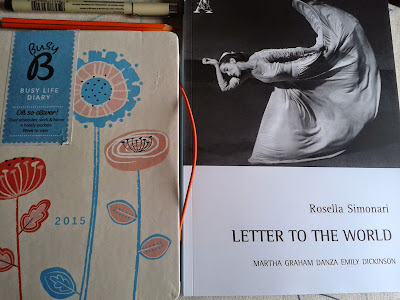 22 April 2015 "Danza e poesia" (dance and poetry), Simonari talks about Letter to the World with Alessandro Pontremoli, Dance History professor at the University of Turin. Introduction by Pat Carra, renowned cartoonist and coordinator of the feminist online satirical magazine Aspirina La Rivista (with which I collaborate). Audiovisual projections, Libreria delle Donne di Milano, Milan, 6.30 pm. A buffet will follow. 29 April 2015 "Così lontane, così vicine: Martha Graham ed Emily Dickinson" (so distant, so close: Martha Graham and Emily Dickinson), Tè Letterario, Istituto Superiore "Matteo Ricci", Macerata, 3.30 pm. 2 May 2015 Simonari talks about Letter to the World with Enrico Guida, eclectic and well-read bookseller. Audiovisual projections, Libreria Il Grillo parlante, Chiaravalle (Ancona), 6.30 pm.